Help freelancers to find work, build professional relationships, and manage their businesses. User and desk research, user experience design, strategic design, graphic design, storytelling and after effects. We interviewed 10 creative freelancers at different stages of their careers, from beginners to experts, as well as beginners to experienced at their freelancing career. Based on our synthesis we discovered a lot of insights of how we could better assist the freelancer community. 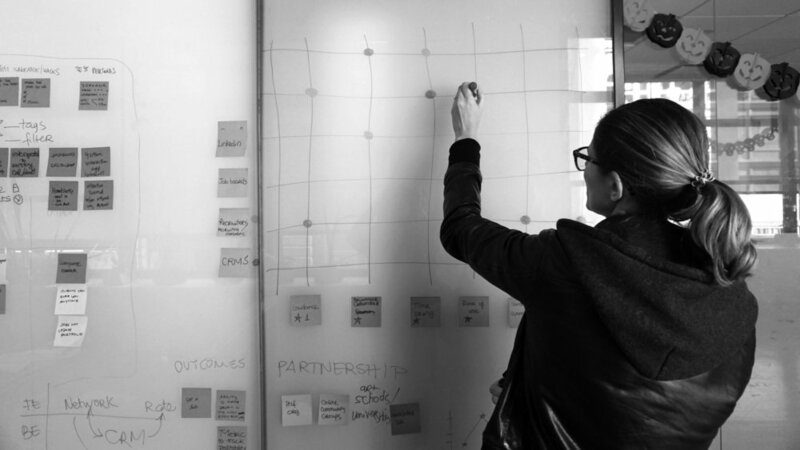 We decided to explore how we could help them generate new leads. We surveyed 49 freelancers to understand better what drives their market and what they need help with when managing their business. What channels do you get most of your clients from? Based on our user research, we discovered that word of mouth is not the most efficient method to find work for those who are at the beginning years of their freelancer career. What do you wish you had known when you first started freelancing? Knowing that word of mouth is the method freelancers get most clients from, we decided to focus our solution on assisting freelancers to get most out of word of mouth by creating a platform that will allow them to find, build and nurture meaningful relationships. Card game to connect freelancers and recruiters to test our idea. We had the idea of creating a matching app to help creative freelancers to get connected to collaborators, recruiters or hiring managers. To test our idea we performed a card game, in which half of the group was recruiters and the other half was creative freelancers. The card game had fake profiles of freelancers, recruiters and hiring managers. Each participant had a card that represented themselves in the game and received a set of cards to select from. We asked them to select either a freelancer or a recruiter based on their interests and skills. Participants let us know their selections and if they selected someone and that same person selected them back they would get a match and receive a slack notification from us, after that they were encouraged to talk to each other. We discovered that participants expected to see more details from the recruiter or hiring manager and what type of jobs they are looking for. People had fun with the experience and felt encouraged to speak with each other after they got matched. Users can find clients and collaborators based on availability, mutual interests and expectations, and 2nd/3rd degree connections. Users can give or receive referrals from their existing network. Users can showcase their resume, portfolio, their website and social media information. Home screen on desktop and mobile apps. In the home screen, users have a personalized calendar to keep themselves organized, as well as, reminders of important dates from their connections and when is time to catch up again based on their personal preferences. In the Contacts screen, users can organize their contacts and have their information all in one place. In the News Feed screen, users can get the latest news from their contacts and what they have posted on social media networks. In the Projects screen, users can add information about a project and a client. In the Reports screen, users can manage their time and business by generating reports. 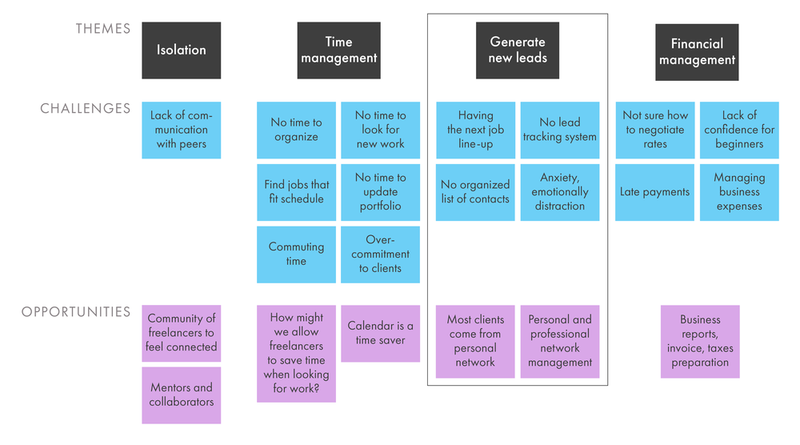 Currently in the market, there are products and services that freelancers use to interact or manage their network. 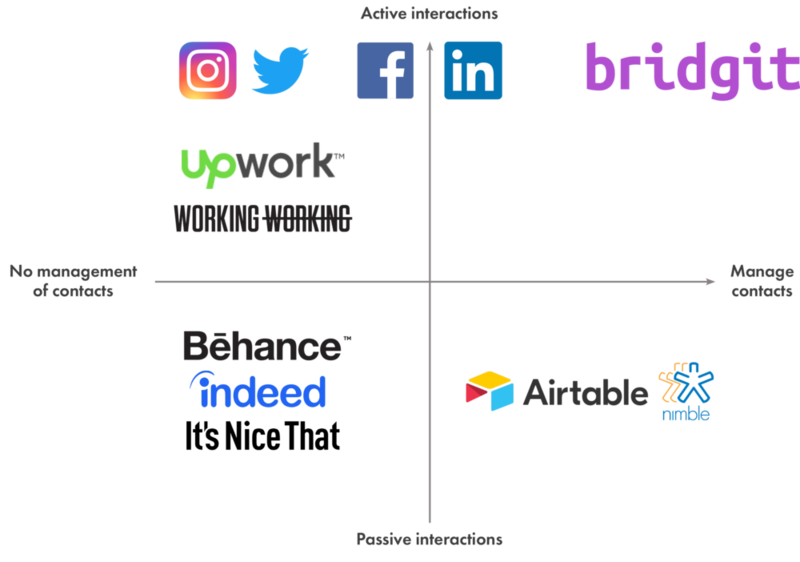 We categorized them into two different spectrums: the vertical axis is about how much these platforms allow freelancers to interact with others to build relationships. The horizontal axis is about how the platform organizes and keep track of the users’ contacts. On the lower left corner, we have job boards, which have no direct interaction between users in the platform and allow users to store your contacts. On the the top left corner, we have social media and recruiting platforms, where users actively interact with connections but there is no comprehensive system that organizes them. On the bottom right, we have personal CRMs (customer relationship management) while they do offer a comprehensive system that organizes your contacts, there are no place for them to actively interact with each other. It is not trying to compete with job boards and recruiting platforms. Knowing that most clients come from existing connections, our goal is to allow users to optimize their chances by using their existing network through 1st, 2nd and 3rd degree connections. It is different from social media platforms because allows users to keep track and organize leads on a more efficient way. It is different from LinkedIn because users are matched with other users based on similar expectations, so the chances to get an opportunity is higher. It is similar to personal CRM platforms, by offering contact managing tools, but it is different because it is also helping users to find potential leads. The freelance community is a fast growing emerging market. We are about a decade away from freelancers becoming the majority of the workforce. There are currently over 57M freelancers in the United States, within that population, there are 12M creative freelancers who we are targeting. And based on the mass market conversion rate, we plan to capture 100K users in the first year with our MVP. Our main revenue streams are ads, premium package and sponsorships. Also, starting on the 2nd year, we will add a new one which is SAAS model (Software as a Service) to corporations like SYP who want to build their own “open talent source” community. Within four years, we are expected to raise 11.3M dollars in revenue. We will test our MVP in New York City, then market Bridgit in the US cities with most creative freelancers and events and conferences like the WordCamp, Future of Web Design and New Media Expo. In addition, we will partner the with Freelancers Union and WeWork.